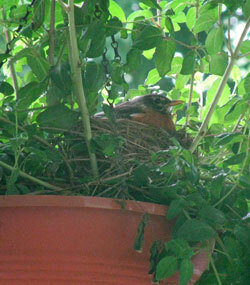 Some people who report finding bluebird eggs in odd locations (in a potted plant for example) are really seeing eggs of another species, like the American Robin nest, eggs, and nestlings in these photos. House Finches lay eggs that are bluish-green, and sometimes use a nestbox. See more photos. 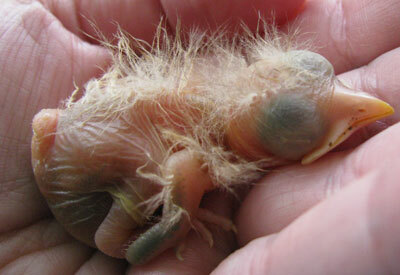 Starlings also lay blue eggs, but they are bigger than bluebird eggs. 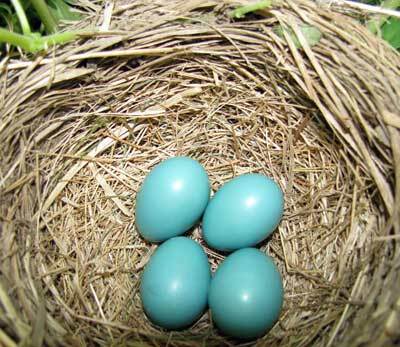 About 4-5% of bluebirds actually lay white eggs. Robin hatchlings are much larger than bluebird hatchlings, and have longer tufts of white fuzz along their spines and forehead. They are incubated for about 12-14 days, and fledge in 14-16 days. Birds that nest in an "open" cup (vs. cavity nesters) need to develop and get out from their vulnerable location faster. Photos by Bet Zimmerman. Bluebirds have taught me a few things. First, the more you think you know, the more you have to learn. Second, never say never because they will fool you every time! Third, they have taught me to stop sweating details in my life and learn to enjoy the simple things. There are things far greater than ourselves out there, going on unnoticed right before our eyes.